How does hardwood compare to other flooring materials? Other floor covering materials simply can't compare to the natural beauty of hardwood flooring. Hardwood floors outperform and outlast almost any other floor covering material. And hardwood floors are just as easy to care for as any other floor. Hardwood floors are much like other flooring materials in that there are many different price points. There are inexpensive hardwood floors and there are more costly hardwood floors. But...when you compare the life cycle of hardwood floors versus other floor covering material, then you realize just how inexpensive hardwood floors really are. Most hardwood floors will last a lifetime while the average lifespan of carpet is 7-9 years. So you could replace carpet 3 or 4 times in a 30-year period, while simply maintaining one hardwood floor. What's the best finish for a hardwood floor? All Robbins floors have either ForEver II or ForEver II Satin finishes. Both finishes now include Aluminum Oxide which provides a tough, wear resistant finish. ForEver II ( average gloss level is 70%) and ForEver II Satin (average gloss level 35%) are made using aluminum oxide crystals suspended in multiple layers of ultra-violet cured urethane. This is the finish even a laminate floor would envy. 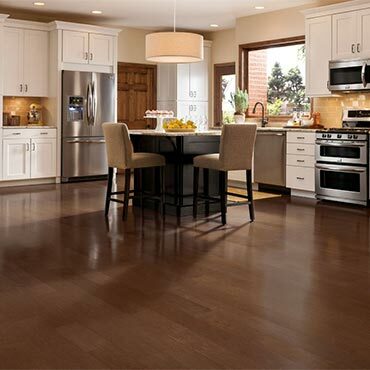 You can now have REAL wood floors with the durability of a laminate floor. Aluminum oxide combined with urethane also makes maintenance fast and easy, while allowing the beauty of hardwood grain patterns to show through. Full Finish Warranties for Premium Collection products is 25 years, Standard Collection products 15 years and Value Collection products 10 years. Are hardwood floors easy to care for? Yes. In fact, hardwood floors are just as easy to care for as any other floor covering material. Normal care such as sweeping or vacuuming to remove dirt and soil is generally all that is required. For specific care instructions, please refer to Care and Maintenance. Where can hardwood floors be installed? Hardwood floors can be installed almost anywhere in the home. Solid products can be installed on or above the outside soil line while engineered products can be installed on, above, or below grade, including basements. The only place Robbins does not recommend hardwood flooring is in wet areas of the bath. Can I install hardwood floors myself? Of course. All it takes is a little planning and a free weekend. Complete installation instructions are packed inside each carton of Robbins Hardwood Floors. Installation can be glued-down, nailed-down, or even stapled-down in some instances. Modern Home Floor Covering, Inc.
Ft. Worth Carpet Co. Inc.